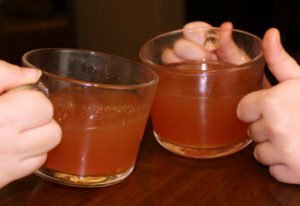 Forget that powdered stuff, mulled cider is so easy to make at home. It’s a favourite cold weather treat in our house. 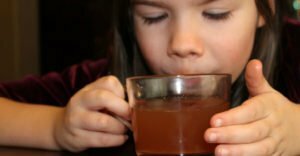 Coming home from school to a warm cup of cider is always something my kids look forward to (particularly on days when the walk home from the bus is chilly). You can get this ready in about two minutes and then leave it simmering on low until you’re ready for a warm drink. Mulled cider always smells SO GOOD when it’s simmering. It’s the first thing you notice when you walk in the house. Mmm… cider. 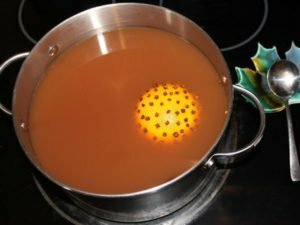 This mulled cider recipe evolved from my mulled wine recipe. I have been making mulled wine for well over a decade, and over the years I have tinkered with it until I’ve ended up with something I’m happy to drink and proud to offer my guests. With kids on the scene a non-alcoholic version became a necessity. (Listen, if I could smell that mulled wine and was then told I couldn’t drink it, I’d complain too!) So this is basically just my mulled wine recipe, minus all the booze. Mulled cider tastes best when it is made with, well, cider. I usually pick up jugs of fresh local cider from the farmer’s market or even the neighbourhood big chain grocery store. You can also make it with unsweetened apple juice. My kids like it either way, I prefer the cider version. If you want to get all fancy you can stud an orange with cloves and float that in the cider. Much to my children’s dismay, I usually skip this step if I’m just making it for us. 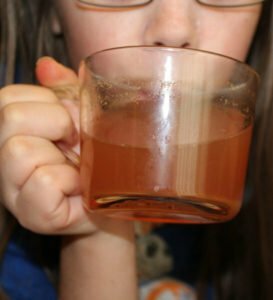 I should also note, if your kids get weird about “floaty bits” in their drinks you will want to use a small piece of cheesecloth or a tea strainer to hold the cloves. Pour in the entire 2L jug of cider or unsweetened apple juice, and about half a jug of 100% cranberry juice into a large stock pot. Add the juice from one orange (cut one of the seedless oranges in half and squeeze it into the pot). Add whole nutmeg and cinnamon sticks. If you like you things on the sweet side you can also add honey to taste (I usually add about a tablespoon of honey). For the cloves you have a few options. The first option is to put the whole cloves in on their own. If you’re picky about tiny floaty bits ending up in your drink, you can place the cloves into a tea strainer, or tie them up in a small piece of cheesecloth. If the occasional stray clove piece doesn’t phase you, you can just add the cloves loose to the pot. Either way you want to put in about 12 whole cloves. The other option is to stud an orange with cloves and float this in the pot. 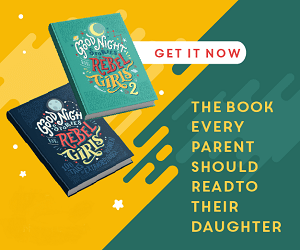 It takes a few extra minutes, but it looks pretty and my kids get a kick out of it. To stud the orange you will need a handful of whole cloves (30 or more). Take a clove, poke the pointed end into the orange and press firmly down. Repeat, until you have an orange that is covered with cloves. Now that you’ve added your whole cloves (or clove studded orange), bring the pot to a boil. Once it’s boiling lower the heat to minimum. Peel and segment the remaining two seedless oranges and add the orange sections to the pot. (Be sure to wait to add these until the liquid is done boiling, or else they can start to come apart and add loose pulpy bits to your drink). You can drink it right away, but it will taste best if everything has time to mingle. I suggest leaving it on low for about 40 minutes. Sounds like a great warm treat, I have never tried mulled cider or wine for that matter, and they sound very interesting!! I love apple cider when it’s really cold but I tried it warm and I can’t say I disliked it but I do prefer it cold.It was tasty but just not for me as a warm drink. Yum for both adults and the kids. This cider seems like the perfect drink to warm the old bones in the winter! Thanks for the recipe! I love mulled cider. Thank you for the recipe! 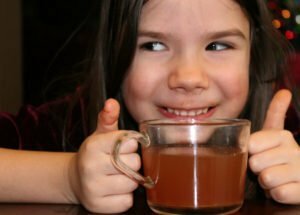 I love hot cider especially on a cold or rainy day! Never tried Mulled Cider but it sounds like something I would enjoy so I will definitely have to try out your recipe. There is something so comforting about homemade apple cider. My mom used to make it for me at Xmas, and it’s delicious. I’m going tp make this for our potluck … sounds delish!